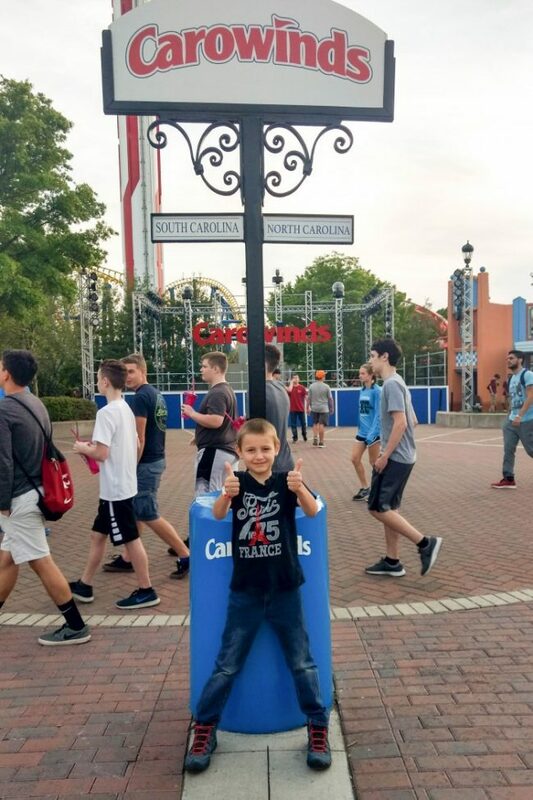 Thank you Carowinds for sponsoring this post. Explore the all-new Camp Snoopy during your next visit! I’m a thrill seeker and can’t resist a good roller coaster. Lucky for me, I have a family of boys that love coasters as much as I do! I knew that we would all have a great time at Carowinds Theme Park. After a day spent in the park, I learned a lot that can help a first-timer navigate this theme park with ease. With these insights before your trip, you’ll be able to make the most of your family day at Carowinds! 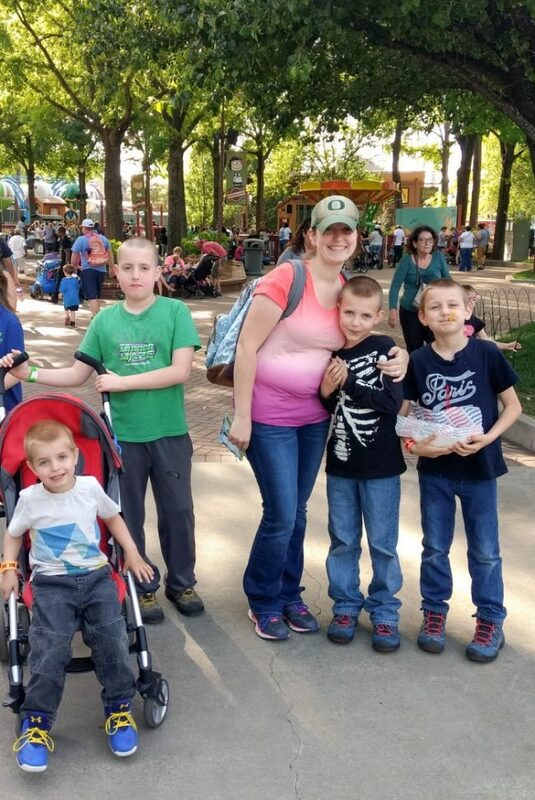 We picked a day, planned a trip to Carowinds, and kept everything a surprise until the night before, when we broke the news (after letting them guess and wonder for a while) and they all couldn’t be more excited for the next day. 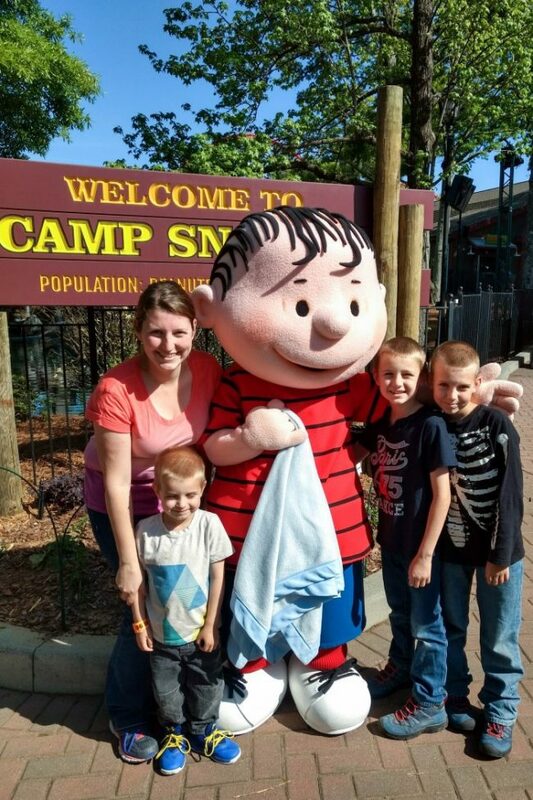 Carowinds is just two and a half hours from Raleigh, where we live, so it’s perfect for a weekend getaway! Carowinds has a unique theme, and slogan, “Where the Carolinas come together!” The park literally crosses the state line and you can spend time in both North Carolina and South Carolina throughout the day. My boys got such a kick out of walking the state line, and jumping back and forth. After entering the park, we headed to the right and went counter-clockwise through the park starting in Carousel Park. We went on Vortex, The Grand Carousel, Ricochet, Scrambler, and the Carolina Cyclone. It was fun to see all the variety of ride styles as we traveled around the park. This selfie picture was taken when we were next in line for Ricochet, which pleasantly surprised all of us! It feels like you’re hanging off the side of the rails as it winds back and forth at full speed. It’s really fun and much more exciting then we were expecting! Camp Snoopy was easily the prettiest area of the whole park. It just felt like there was shade everywhere with so many trees and closely clustered rides. 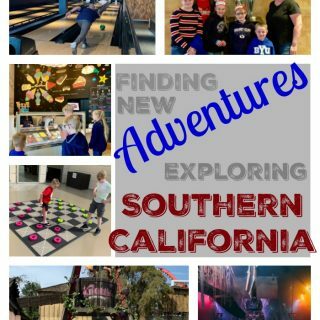 It’s an awesome area to visit if you have young children. We were greeted at the entrance by Linus, and stopped to get a picture. My 3 year old loved that he was carrying a blanket around and had to tell us all about it! 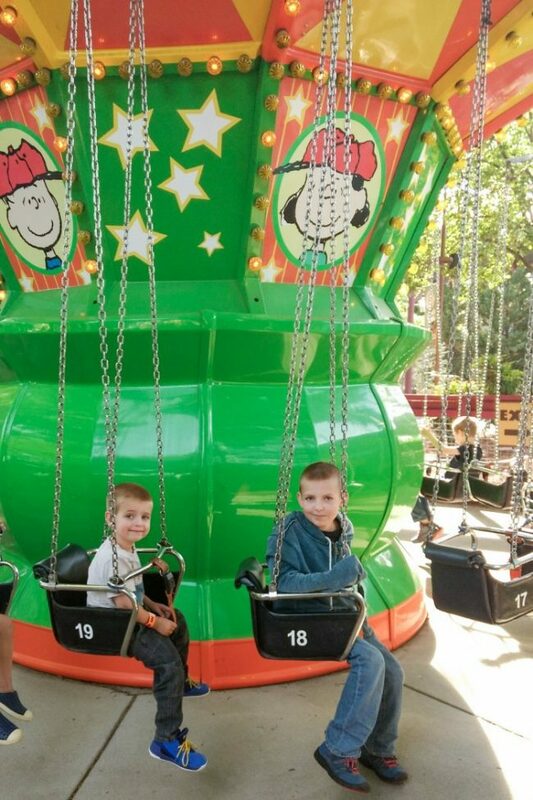 There are so many absolutely darling rides in the Camp Snoopy area, like the Snoopy vs Red Baron airplane ride. 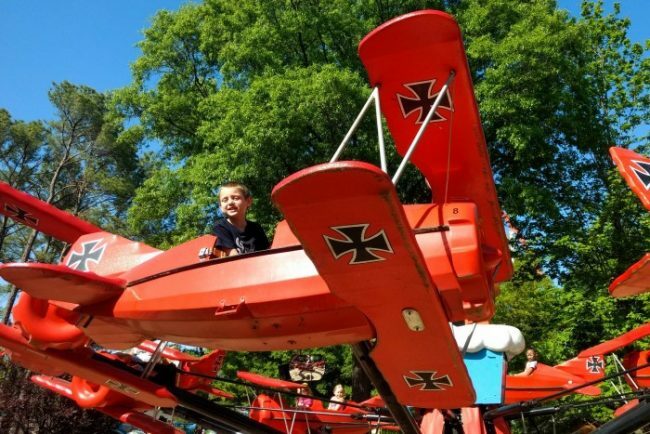 My 3 year old is obsessed with airplanes so he was grinning ear-to-ear as he exited the ride! Then, our 3 younger boys and my husband took a turn on Pig Pen’s Mud Buggies. This ride is so cute they are bouncing ATVs! After some time spent at Camp Snoopy, I got to sneak off with my oldest son to ride on the Intimidator before we left the park. It was my favorite ride of the day, so much fun!! It’s a fast ride and as you go up the second big hill it feels like you’ll go flying right off the rails as you can’t see them in front of you dipping down into another turn. I loved every minute of it! It’s actually one of the top 10 tallest coasters in North America! We had an incredible view of the park below us from up top. 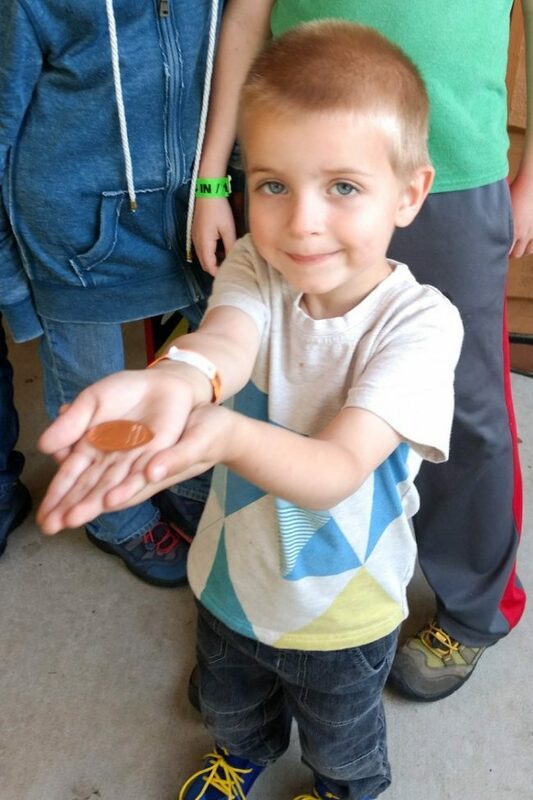 Of course before we could leave we had to find a penny smasher, as we collect them whenever we can spot them (world’s least expensive and easiest souvenir)! There were several locations throughout the park, but we decided on Snoopy and my 3 year old carefully guarded the penny for us the rest of our time at the park. As we were exiting the park, we spotted the Fury 325 cruising right under the entrance walkway and had to stop to pose for a picture. We’ll be back again, just as soon as we can be! If you’re in the area, a season pass is an affordable way to visit the park over and over again! You can even register for a free Pre-K pass for your young children ages 3-5. Children ages 2 and under are free. Here are some other important things to know, before your trip to Carowinds! 1. Carowinds App – You can download the free app to help navigate your way through the park. There’s a map with walking times and all the dining, attractions, rides, and shows marked. 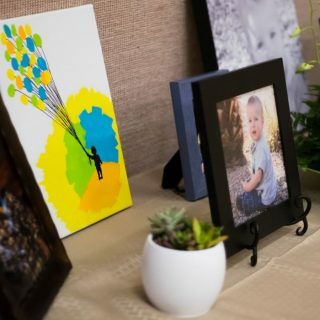 This was really helpful, as my boys were always snagging the map from me. The app may be able to help estimate wait times, but this part of the app wasn’t working the day we were at the park. 2. Fast Lane – Carowinds offers Fast Lane, which means the lines are a bit longer for those without Fast Lane. That being said, most lines were about 30 minutes. 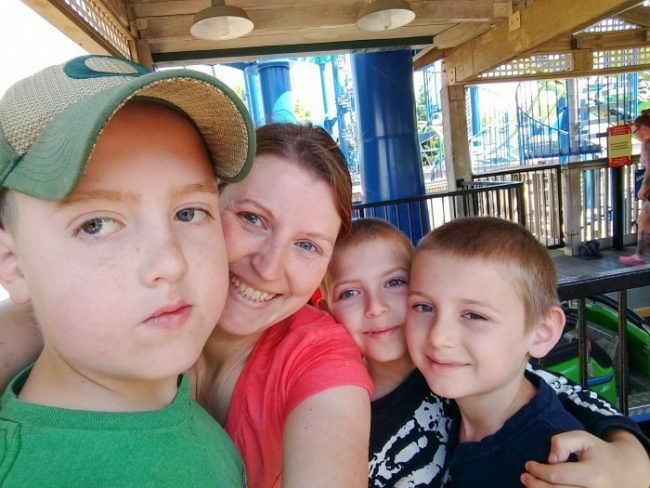 We had a 1-hour wait for the two large coasters – Fury 325 and Intimidator. If you’re planning just one day at the park, you may want to consider Fast Lane. Those with the Fast Lane had virtually no wait so this would definitely help to maximize your time and experience in the park. 3. Dining Pass – If you plan to spend a full day in the park, you’ll want to consider the All Day Dining pass. For one fee you can dine at a variety of locations throughout the park with an entree and a side every 90-minutes! It’s a steal of a deal if you dine frequently. You can split the large meal portions between an adult and child to stretch the value of the dining pass farther. Our favorite place to dine was Harmony Hall Marketplace. There’s something for everyone and with all the different dining options none of the lines were very long. There is also tons of seating and it feels like a fun party atmosphere inside the dining hall. 4. Souvenir Bottle & Refills – There are drink stations everywhere throughout the park that are very easy and convenient to access. You can bring in an empty water bottle and refill with cold water at these stations, which is what we opted for to stay hydrated. Or, choose the Souvenir Bottle which is just $10.99 if you purchase it before heading to the park. You’ll get free refills your first visit which will easily cover the cost of your cup! 5. Free Pre-K Pass – For a limited time, you can register for a complimentary Pre-K Pass for children ages 3-5. Registration is open through May 28, 2018 and then will need to be redeemed in park by June 17, 2018 with a valid identification like a birth certificate. 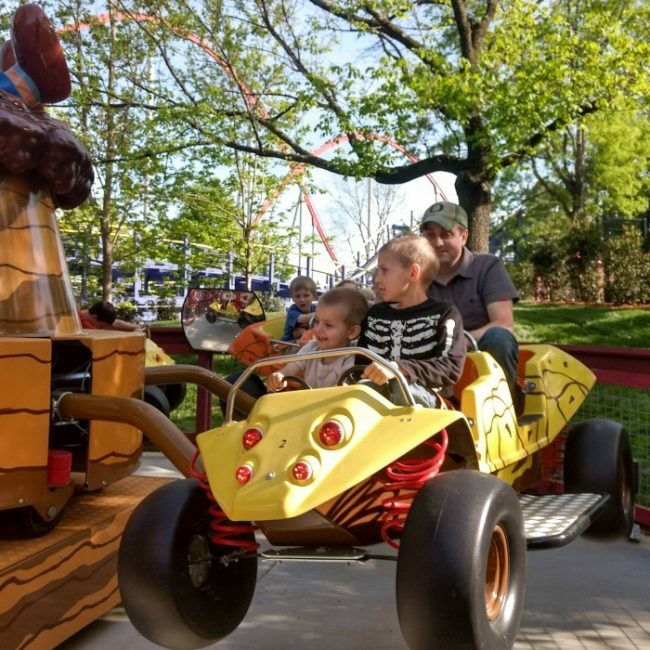 The pass is good for the entire season and even includes admission to Dinosaurs Alive and events like The Great Pumpkin Fest! 6. 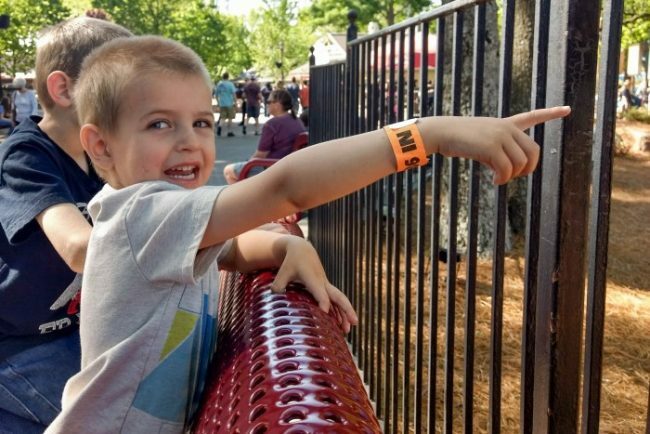 Season Pass – If you live within driving distance, a Carowinds season pays for itself in 2-3 visits making it a great option to get the most out of the park. When you have a season pass, you’ll be able to visit for a few hours without feeling the need to cram in as much of the park as possible in a single day. The Gold pass also includes complimentary parking and events! There were signs throughout the park that you could upgrade your daily admission to a season pass, so if you give the park a try and fall in love with the attractions, you may be able to extend your visit and visit throughout the rest of the season. 7. Buy Parking Online – For those without a season pass, buy your parking pass online before your trip! You’ll save $5 off the daily rate. It’s a great way to streamline your day by purchasing everything you need online before you go. 8. Carolina Harbor Water Park – A daily admission ticket (and season pass) includes admission to Carolina Harbor Water Park which is attached to the park. 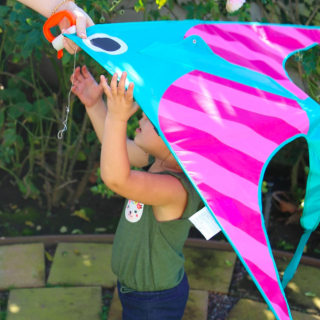 This is perfect for warm summer days to spend some time on the thrills and some of the day at the water rides! 9. 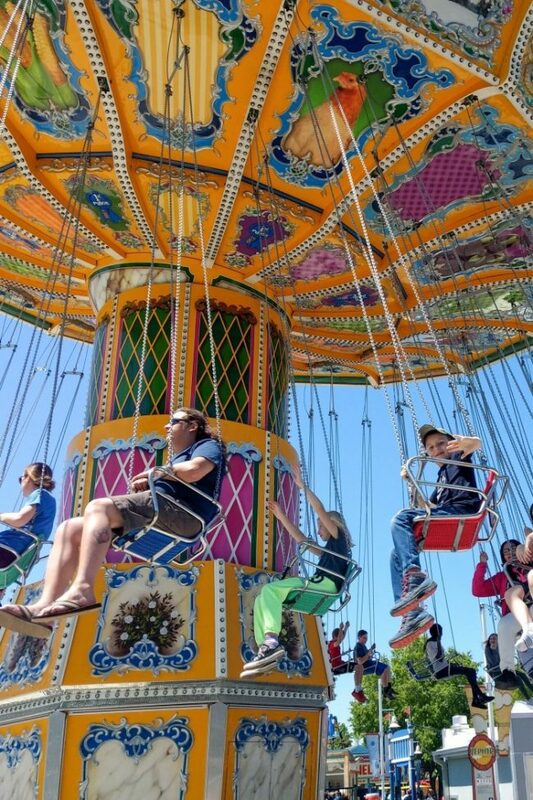 Separate Ticketed Rides & Attractions – While there is so much to do in the park, there are also some attractions that require a separate admission. Rides like the SlingShot and Ripcord thrills are a separate fee once in the park. Dinosaurs Alive! is also a separate fee of $5/per person or included with a Gold or higher season pass and with the Pre-K Pass. 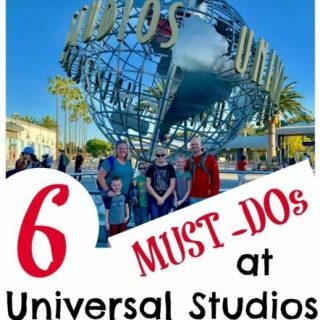 Knowing ahead of time what attractions are separate can help you plan your day more efficiently and avoid disappointment. 10. Height Check Stations – Spend a minute when you first enter the park to check your children’s heights. 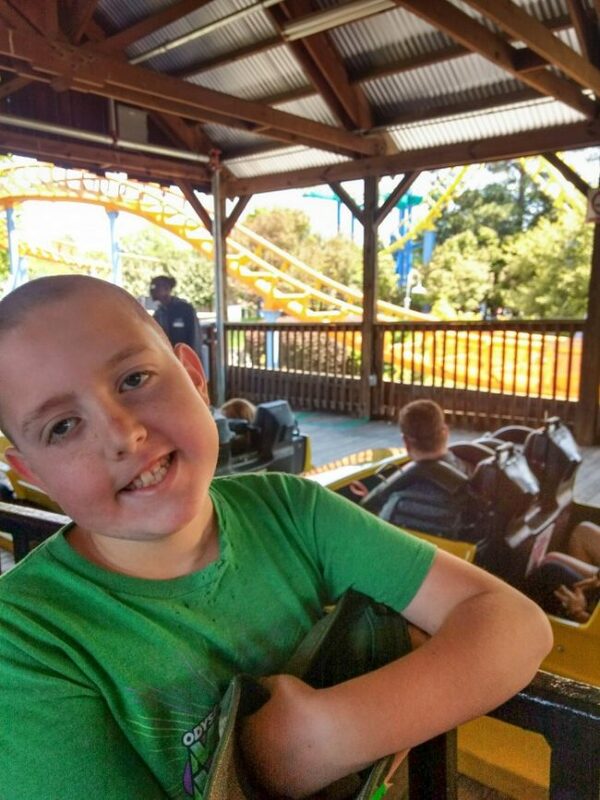 They’ll get a wristband and this simple step will make it easier to know in a glance which rides they can go on and when they may need an accompanying adult. It also means you don’t have to worry about discrepancies later if they’re close to the height requirement! The height check station is at the very front of the park, just past the entrance gate. Since I live in Raleigh, I just popped down for the day. I’m not positive what all else there is to do in Charlotte. There’s an IKEA there, lol. But that’s about all I know of so far. Sorry I’m not more help in that way. If the price isn’t much more for a 2-day pass, I’d probably go with that. If it’s close to paying for two 1-day admissions, I’d probably cram it into one day and do other things with my time. North Carolina is beautiful, but very humid right now. You can detour a couple hours to the beach which is really fun. I’d also look for a local hike! We just brought along a reusable water bottle, but any empty container that you could fill up at a water fountain would be fine. I don’t imagine they’d have any problem with completely empty toss-away water bottles. And if they do, just toss them at the park, you’re not really out anything. I forgot all about Carowinds! I went there as a kid over 40 years ago. I really need to go back! The park looks amazing! 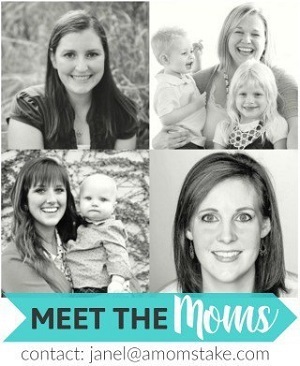 This seems like the perfect family trip for summer vacation. I would have to agree with you on the roller coasters as they are definitely my favorite as well. I have never been to this theme park. I have heard great things about it and really want to put it on my bucket list adventures! What a fun family day you had. This looks very similar to Great America by us. We are all going this year because my kids earned free tickets at school. I’ve never heard of it! It sounds like a great place to visit! So much fun! Ahhhh…. Carowinds is a sister park to Knott’s Berry Farm here in Southern California. I see a lot of similarities like Camp Snoopy! I love Cedar Fair parks! Carowinds looks like so much fun!! I love the meal passes and fast lane passes!! I have always wanted to go especially since my friend MANY many years ago worked there in a show! How cool, right?! 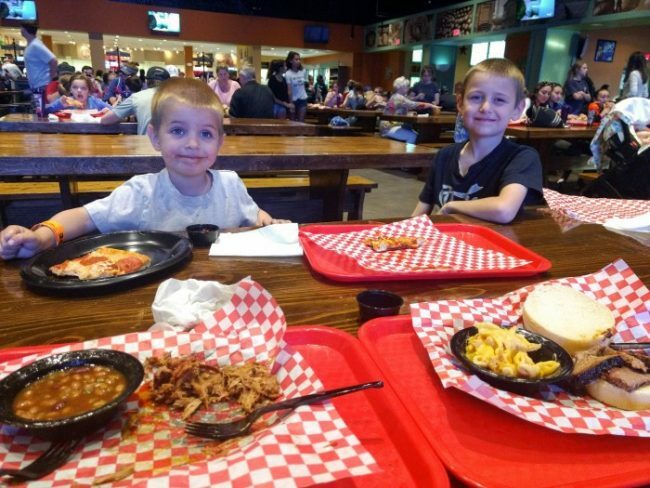 They have something for everybody – what a great family park! This would definitely be worth saving for. Oh that looks like such a fun place to go. I just love a good amusement park. There’s always something there for everyone. This place looks really fun! I would love to spend a day there with my family. 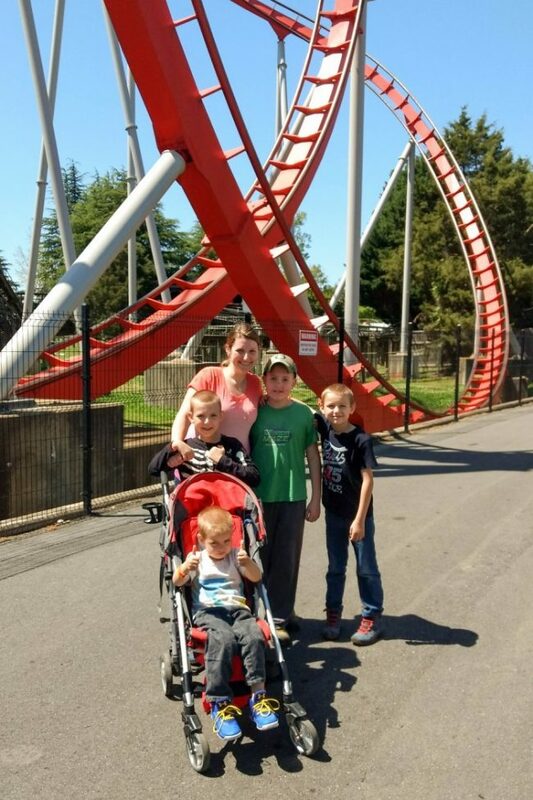 It looks like you and your family had an amazing time. My oldest would love to visit here. She loves going on rides. How fun. We could definitely do a trip to Carowinds this summer. We’ll have to consider going with the Fast Lane. What a seriously fun day! 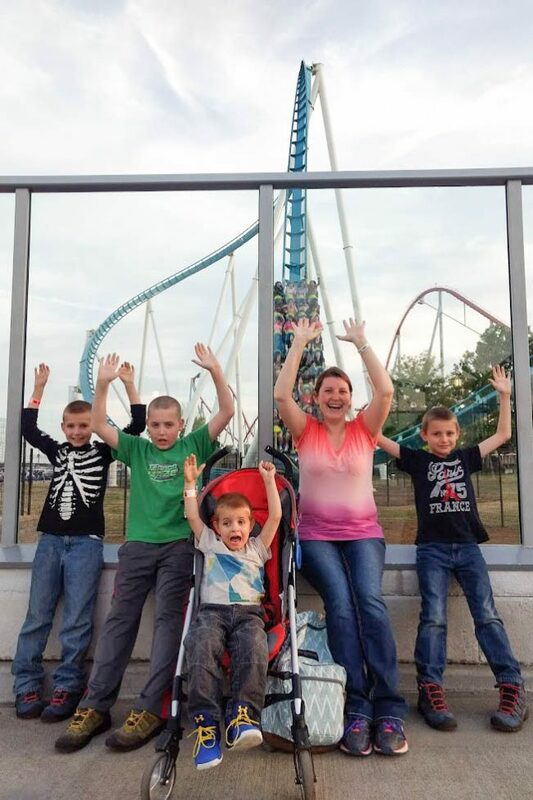 It looks like your kids had an absolute blast! I wish we had a Carowinds close to us! This looks a great place for weekend outings.